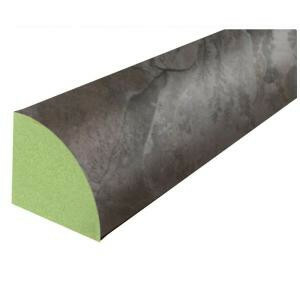 This laminate molding is used to cover the expansion space at wall base and other verticle surfaces. Our quarter round is color coordinated to match Innovations Black Slate or Black and White Chess Slate laminate flooring and provides a finishing touch to every room in your home. A convenient 94 in., length ensures ease of installation. Buy online Black Slate/Black and White Chess 3/4 in. Thick x 3/4 in. Wide x 94 in. Laminate Length Quarter Round Molding 369191, leave review and share Your friends.